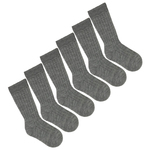 You will hardly find anything to keep your kid’s feet warmer than pure virgin wool socks. It doesn’t matter how warm your kids winter boots are. Once their feet perspire, your child will end up with cold damp feeling. With good quality 100% wool socks your kids’ feet will always stay warm and comfortable, because moisture wicking wool is an excellent insulator. Wool can hold a third of its weight in moisture and keeps its insulating properties while wet, which is perfect for sweaty feet. Wool fibers naturally odor resistant due to antibacterial properties. Excellent organic knitted thick socks for children with sensitive or eczema prone skin. Made of purest hypoallergenic materials, no toxic coloring, no pesticides, no insecticide, and no fire retardants.